"Royal Enfield Interceptor Parts / Sparepart Dealers Notice board"
For Dealers of Spareparts to the Royal Enfield Interceptor. and for anyone to broadcast source for getting Interceptor Spares!! Please NOTE. This is for selling Royal Enfield Interceptor Items Only. 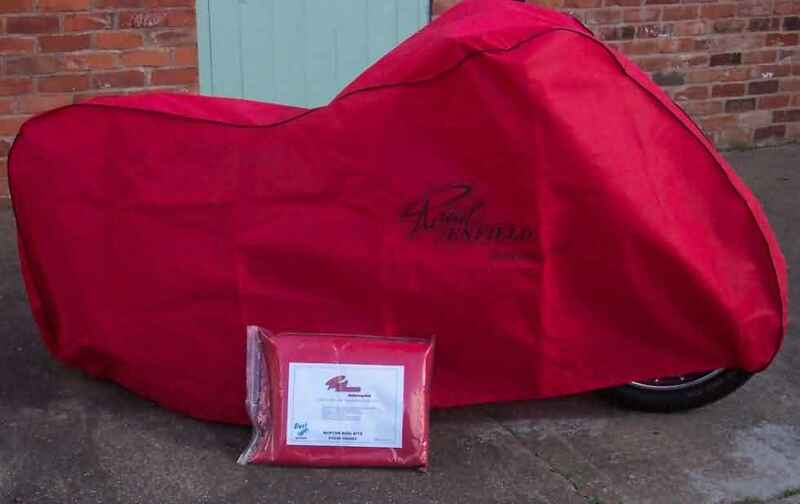 Please find attached photo (click and maximise) of motorcycle dust cover. 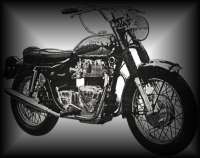 The one pictured is for Royal Enfield Interceptor, we also have these available for BSA, Triumph, Norton and all other models. These are £35 plus VAT. Also attached is a photo (click and maximise) of Royal Enfield GP 5 250cc racer tank and seat unit complete with monza cap £395 + VAT, which we have just had remanufactured. For more details please contact Burton Bike Bits 01530 564362. We now operate a mail order only service. We now have back in stock Royal Enfield Interceptor MK2 fork stanchions 49802 £60 pair, we also have these available hard chrome 49802C £72 pair. We still have Genuine MK2 workshop manuals and sales pamphlets available. also genuine MKIA parts books and sales pamplets. This is the 2nd of Hitchcocks online parts books. It is now up and running on the web site. This is for the 1967 Series 1A and covers the TT and GP model. Take a look in the "Parts Books Online" section. Mudguards as the RE 700cc VAX Interceptor. Motorcycle Sales & Service, Inc.
We now have back in stock the 49584 chrome rear mudguards (beaded edge) for MK1A and MK2 Interceptor. We now have the alloy barrels in stock for the 736cc Interceptors. These are a one piece alloy barrel (both cylinders cast as one barrel). They are a great improvement over the originals as they hold the crankcases more rigidly, helping to prevent the chaffing of the crankcase mouth which was a common problem with the originals. Part Number: 46129A, Price: 395.00 Pounds (Plus VAT if applicable). I´ve just had some Internet-contact with "www.stroehle.de" the firm which will produce those Aluminium alloy-cylinders for the Interceptors. They believe that they can offer them from January next year on. The price isn´t calculated yet. It´s right, there is a German Company ( it´s a good friend ) producing Interceptor cylinders. I´ve got them - but the mine are the prototyp - made from a special aluminum material - CNC mashined and nicasil coated. With the original bore - 736 ccm. Friends and me visited the last Manx classic races in Aug./Sept. 2002. I drove my Interceptor - now with 4500 km more on the clock. No problems with the cylinders. The bike has not be ridden very fast with the crowd - between 55-75 mph. But sometimes I tested the higher pace - the clock shows me the 105 mph and I felt there was a little bit more. And no vibrations that´s very important. The engine is mostly original but the oilsystem is a little bit improved. I did some improvements more with the electricalsystem and ignition. The bike is very reliable and starts with two or three kicks. For more information or pics give me some lines per email. You get Cylinders with less wight, nicasil coated with a better termical condition, no material mix like the old ones. I´ve got one for test and I can only say after many miles without trouble, it works great. I rebuilded the cylinder several times for inspection - result - nothing to see - no scratches - nothing. And the oil keeps clean - no rub down from material and the usual graphite derivates. 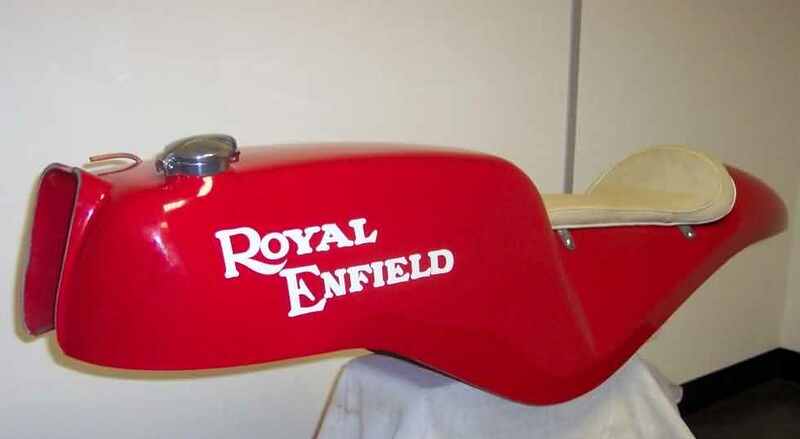 Royal Enfield rear mudguard carrier/seat frame part numbers 42274, 45660, 42270, 46079 £80 each cover most models 350-750cc, this is in addition to the MKIA/MKII type which we already have. Did I mention the MKII Crankcases are now available. I have just had the first of a Batch of alloy Interceptor barrels. These are one a piece barrel, but there is no reason why they could not be split in to 2, if someone wanted to retain separate barrels. Price has not been finalised yet as I am waiting for all the bills to come in for the machining. pairs with out any problems. Guys in case you haven't noticed there is a German Company making Interceptor cylinders. Could be worth checking out! FOR SALE:Interceptor Cranc cases, etc. We now have the Royal Enfield MK11 crankcases available (bare) £650 pair. Also back instock 49584 chrome rear mudguard MK1A/MK11 £75. 49551 rear mudguard carrier/seat frame £85. In progress MK1 rear mudgard/seat carrier. Please contact us direct with questions.